Incredibly, we don’t have a formal family portrait. There’s lots of photos of the six of us but the only professional ‘portrait’ I have is my set of wooden peggies – unconventional, but nonetheless charming. I think I may have to add these personalised paper dolls to my portrait collection. A few years ago we featured unique paper dolls created by designer Jordan Grace Owens – I was impressed by her one-of-a-kind creations with ‘moveable’ limbs. 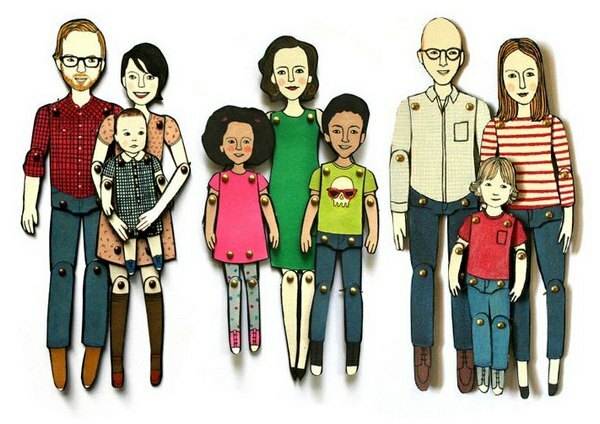 Owens is still creating beautiful paper dolls, now with a personal touch. Commission Owens to create a playful portrait of the whole family, pets included. You provide the photos and choose the clothes and Owens illustrates quirky, stylised moveable paper dolls of your favorite people. The dolls are illustrated using marker, ink and colored pencil. 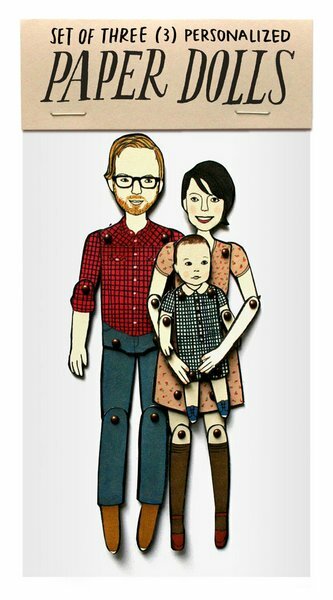 The custom paper dolls are perfect for framing – a rather unconventional but special family portrait! Custom paper dolls begin at approximately $30 for a single doll and range up to $147 for a family of five dolls. Jordan Grace Owens ships to Australia. See our previous posts about paper dolls here.